PORTUGAL: Floating platform designer Principle Power has completed its five-year demonstration project in Portugal for its 2MW prototype. 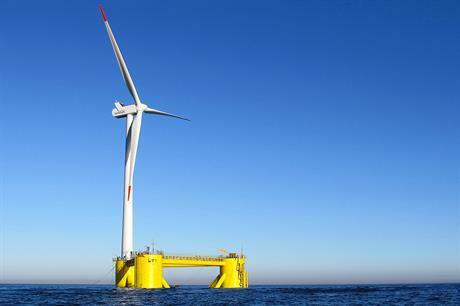 Principle Power said the 2MW WindFloat demo had met or exceeded all of its expectations over the five-year programme. The platform was installed 5 kilometers of the Portuguese coast in October 2011. In the five years, it has encountered 17-metre wave heights and 111km/h winds, generating 17GWh of electricity, Principle Power said. The final stage of the project will be to decommission the platform, which will be fully inspected once it has been towed back to port. Principle Power said it would also consider options for repurposing the platform. Principle Power was dealt a blow last week when its proposed 24MW project off Oregon, northwest US, was dropped by the US department of energy from its funding programme because it was unable to meet deadlines. However, developers have suggested the platform would be the preferred technology for projects off California, Hawaii and France in recent months. Developers Engie (formerly GDF Suez), with EDP Renewables, Caisse des Depots and Eiffage, plan to use Principle Power's WindFloat platform and a turbine of "at least 6MW" off France, at a site in the Mediterranean Sea. Certification body Bureau Veritas approved the design of the semi-submersible platform in April.